Highly popular with both families and watersports enthusiasts, this spacious, gently-shelving sandy beach with its shallow waters lies on the South Devon Heritage Coast in an area of Outstanding Natural Beauty. 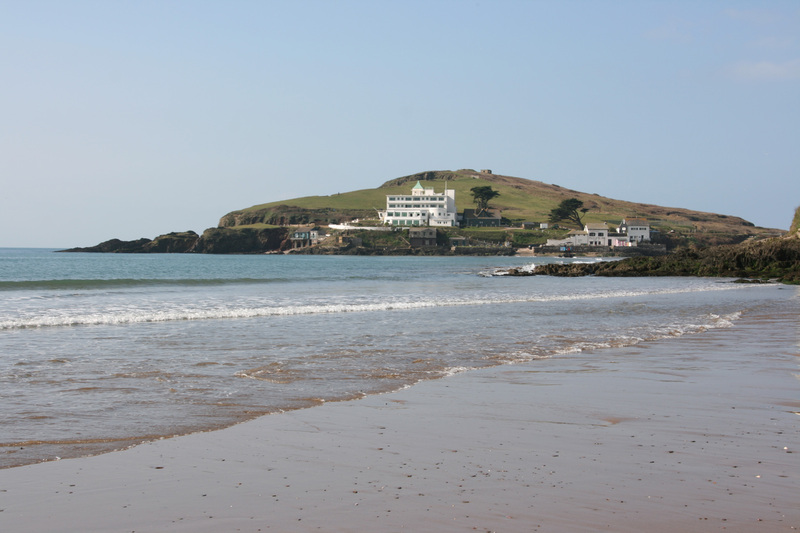 Set against a backdrop of rocky cliffs and the rolling hills of the South Hams, the beach is linked by a causeway, accessible at low tide, to Burgh Island and its Art Deco hotel, immortalised by its association with Agatha Christie’s ‘And Then There Were None’. The Island is also home to the Pilchard Inn pub. The beach is cleaned daily in high season, and at other times a minimum of four times weekly, and dogs are allowed, but restricted to specific areas between 1 May and 30 September. For children the rock pools can be a source of fascination, while the more active can indulge in such activities as bodyboarding, surfing, windsurfing and kiteboarding. The Discovery Surf School shop will hire out the equipment you need. If reassurance is needed, the two RNLI lifeguards are present from 10:00am till 6:00pm from the start of May until the end of September. There is also a first aid room. Bigbury also boasts a beach shop selling such beach accessories as inflatables, buckets and spades, and bodyboards and wetsuits. The Venus café serves both hot and cold local sustainable food, and also hires out beach wheelchairs. The 900-space car park is open 24 hours a day, and there is a reasonable mobile phone signal in some areas of the beach.